Our 4Knines Extra Large Dog Bed Liner is made of durable waterproof material that will keep the interior of your pets bed clean and dry. It will keep the bed from developing mold, mildew or other odors while protecting against dust mites and other allergens. The soft, quiet fabric is specially designed so you do not hear the bed every time the dog moves around. Easy installation with the side zipper opening, allowing you to place the bed inside. This liner is machine washable and air dries. The Extra Large Dog Bed Liner measures 54 inches by 36 inches. Our dog bed liners are backed by a 2 Year Warranty. We at 4Knines have developed innovative products to look great and last! We are very committed to giving back to the animal community. We donate a percentage of each sale to animal advocacy groups. Nothing But The Best For Your Best Friend! PROTECT THEIR BEDS - When your adored K-9 companion is bringing dirt, mud, hair and other debris into the house it tends to take its toll on their bed. Keep your best friend (pet) comfortable and their beds free of odors, stains, claw damage and other pet related harms. 4Knines was the original cross-stich quilted seat protector and has been dedicated to their customers since day one. Their US based customer service team guarantees your satisfaction for a lifetime! INSTALL WITH EASE - 4Knines designs all their products with ease of use in mind. The 4Knines dog bed cover is just as easy and quick to install as it is to remove. The quiet fabric is made to ensure you do not hear the bed every time your dog moves around on his bed. Easy to install with zipper opening. Stop throwing multiple dog beds in the trash because of accidents or wear and tear. You spend a lot of money on those dog beds! 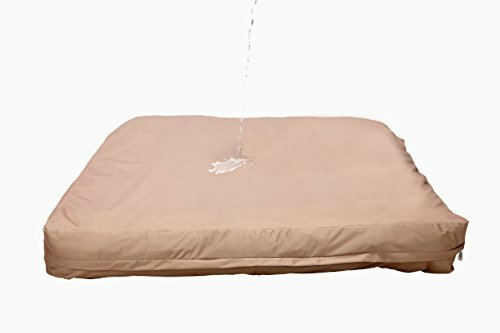 WATERPROOF MATERIAL - This bed cover is made out of a high grade Absorbent top layer that helps contain any messes while the waterproof under layer protects the dog bed despite any accidents your dog may have. s your dog a swimmer or does he like to come in from the rain or snow and lay on this bed? This cover will keep the bed's interior from developing mold, mildew, or that wonderful wet dog smell. The bed liner also protects the bed from dust mites and other allergens. COMFORTABLE & EASY TO CLEAN-The luxury seat cover is beautifully designed with quality materialIt gives a classy look and feel that blends seamlessly with any atmoshpere. Quilted material provides a comfortable cover, high-end look/feel and offers extra protection to your their beds. Machine washable. Hang to dry. Do not bleach. Start protecting your investment with a 4Knines Dog Bed Liner! View More In Bed Liners. If you have any questions about this product by 4Knines, contact us by completing and submitting the form below. If you are looking for a specif part number, please include it with your message.